Urban Leaves India: Workshop on " How to create your own Natueco city Farm"
Workshop on " How to create your own Natueco city Farm"
Which is the perfect healthy food for me and my family? How can I better my relationships with my neighbors? How can I cope with rising prices of vegetables? Wont it be wonderful to grow my own herbs? How can I do my bit to help reduce global warming? Well….. There is one creative skill which can which help you cope. Wish to learn the same? Yes! We all do! But as they say, if wishes were horses, beggars would ride. Most of the time our best intentions remain just that! Wishful thinking. Here’s a chance to learn and act…. JOIN US AND LEARN TO GROW YOUR OWN FOOD! You are what you eat. Come learn how we at Urban Leaves nourish our bodies and souls through the practice of city farming. Natueco Farming and building Amrut Mitti gives us a holistic perspective about how the food we eat is related to all these issues. We hope the workshop will give you both the motivation to start growing your own food and the tools and the network to help you do so. 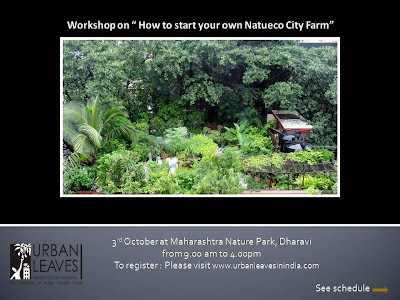 URBAN LEAVES (an Initiative of Vidya Varidhi Trust) conducts workshops on “How to initiate your own Natueco City Farm" at Maharashtra Nature Park ( MNP ) from time to time. The sessions are conducted by Preeti Patil who manages one of the most successful city farms in Mumbai. Preeti has been in charge of this award winning terrace farm since its inception 10 years ago and today with full grown trees, herbs, vegetables and a variety of fruit trees, it stands testimony to the fact that urban farms are very doable. On Central Line one can get down at Sion station and take an auto.On Western line it is close to Bandra and Mahim station. Pl email to urbanleaves@gmail.com for further assistance.